Leawood, Kansas (March 1, 2018) – AMC Entertainment Holdings, Inc. (NYSE: AMC) (“AMC” or “the Company”), today reported results for the fourth quarter and year ended December 31, 2017. AMC set fourth quarter records for the three months ended December 31 period for all revenue categories: admissions, food and beverage and other. Much of the growth in revenue is due in large part to the acquisitions of Odeon Cinemas Group (“Odeon”), Carmike Cinemas, Inc. (“Carmike”) and Nordic Cinema Group Holding AB (“Nordic”). Total revenues increased 53.0% to $1,416.8 million compared to total revenues of $926.1 million for the quarter ended December 31, 2016. Total revenues in 2017 included approximately $438.5 million of revenues from our international theatres as compared to $114.1 million in the three-month period a year ago. Admissions revenues increased 52.3% to $897.1 million compared to $588.8 million for the same period a year ago. Food and beverage revenues increased 47.0% to $415.3 million, compared to $282.5 million for the quarter ended December 31, 2016. Earnings before income taxes grew 13.7% to $14.1 million, compared to $12.4 million for the same quarter a year ago. Net earnings decreased $305.4 million to a net loss of $276.4 million compared to net earnings of $29.0 million for the quarter ended December 31, 2016. Included in the net loss for the quarter was approximately $310.0 million of tax expense in our U.S. markets related to the impact of the change in the U.S. enacted federal income tax rate from 35% to 21% and the impact of a full valuation allowance on our deferred income tax assets. Diluted earnings per share (“diluted EPS”) decreased $2.43 to a loss of $2.14 per share compared to earnings of $0.29 per share for the same period a year ago. Average diluted shares outstanding in the fourth quarter of 2017 increased approximately 28.2% compared to the fourth quarter last year as a result of the successful completion of an equity offering in February 2017, less the effect of 3.2 million shares repurchased during 2017. Total Adjusted EBITDA(1) increased 58.7% to $288.2 million compared to $181.6 million for the quarter ended December 31, 2016. International Adjusted EBITDA for the fourth quarter grew $70.2 million to $98.8 million compared to $28.6 million a year ago. AMC set annual records for the twelve months ended December 31 period for all revenue categories: admissions, food and beverage and other. Total revenues increased 57.0% to $5,079.2 million compared to total revenues of $3,235.9 million for the year ended December 31, 2016. Total revenues for 2017 included approximately $1,355.7 million of revenues from our international theatres as compared to $118.9 million in the period a year ago, due to the acquisitions of Odeon and Nordic. Admissions revenues grew 57.6% to $3,229.5 million compared to $2,049.4 million for the year ended December 31, 2016. Food and beverage revenues increased 51.9% to $1,548.4 million, compared to $1,019.1 million for the year ended December 31, 2016. Loss before income taxes increased $482.8 million to $333.1 million, compared to earnings before income taxes of $149.7 million for the same quarter a year ago. 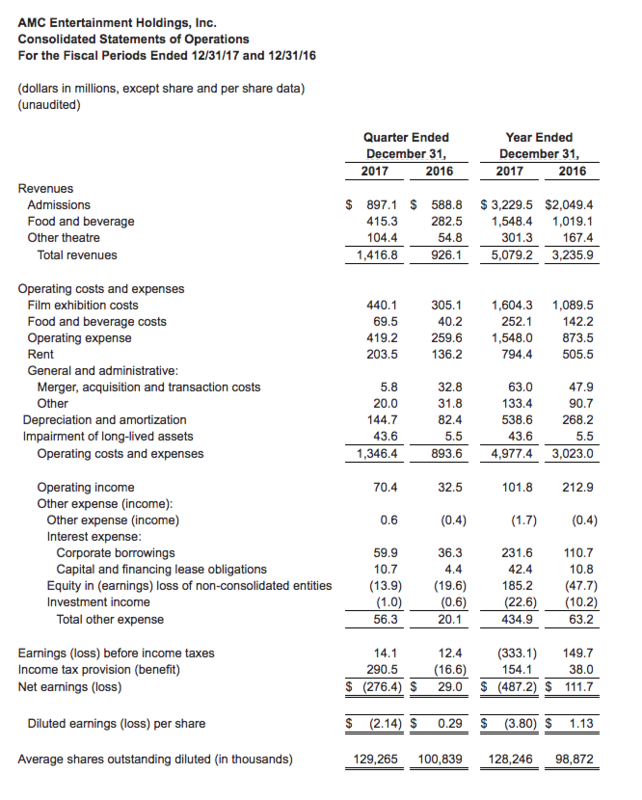 Net earnings decreased $598.9 million to a net loss of $487.2 million and diluted earnings per share decreased $4.93 per share to a loss of $3.80 per share compared to net earnings of $111.7 million and net earnings per share of $1.13 per share, respectively, for the year ended December 31, 2016. Included in the net loss for the year ended 2017 were $208.0 million in pre-tax impairment charges related to the NCM investment and approximately $310.0 million of tax expense related to the impact of the change in the U.S. enacted federal income tax rate from 35% to 21% and the impact of a full valuation allowance on our deferred income tax assets. Total Adjusted EBITDA(1) grew 36.6% to $822.5 million compared to $602.0 million for the year ended December 31, 2016. International Adjusted EBITDA grew $184.1 million to $212.5 million compared to $28.4 million in the same period a year ago. Commentary on the quarter by Craig Ramsey, AMC’s Executive Vice President and Chief Financial Officer, is available at http://investor.amctheatres.com. Additional information detailing select unaudited pro forma financial data for the quarter and year ended December 31, 2017 is included in the fourth quarter 2017 CFO Commentary. The select unaudited pro forma data for the periods combines the historical financial data of operations of AMC, Odeon, Carmike and Nordic, giving effect to the acquisitions, financings and theatre divestitures as if they had been completed on January 1, 2016. The historical consolidated financial information for Odeon and Nordic has been adjusted to comply with U.S. GAAP. The classification of certain items presented by Odeon under U.K. GAAP has been modified in order to align with the presentation used by AMC under U.S. GAAP. The classification of certain items presented by Nordic under IFRS has been modified in order to align with the presentation used by AMC under U.S. GAAP. In addition to the U.S. GAAP adjustments and the reclassifications, amounts have also been translated to U.S. Dollars. The unaudited pro forma financial information is provided for informational purposes only and is not necessarily indicative of what our results of operations would actually have been had the acquisitions occurred on the date indicated. Please refer to the August 1, 2017 Form 8-K and 8-K/A on December 4, 2017 for additional information on pro forma financial statement adjustments. On August 3, 2017, AMC announced that its Board of Directors authorized the repurchase of up to $100 million of the Company’s Class A common stock over a two-year period. As of March 1, 2018, the Company has repurchased approximately 50% of the authorized $100 million, having purchased more than 3.2 million shares of AMC’s Class A common stock for approximately $47.5 million, representing an average share price of $14.86. On October 27, 2017, the Company declared a regular quarterly dividend of $0.20 per share for the quarter ended September 30, 2017, which was paid on December 18, 2017, to shareholders of record on December 4, 2017. The total dividends paid in the fourth quarter of 2017 were approximately $25.9 million. On February 28, 2018, the Company declared a regular quarterly dividend of $0.20 per share of for the quarter ended December 31, 2017, payable on March 26, 2018 to stockholders of record on March 12, 2018. During the fourth quarter, the Tax Reform Act of 2017 was signed into law. Among other things, the Tax Reform Act permanently reduces the U.S. corporate income tax rate from a maximum of 35% to a flat 21% rate, effective January 1, 2018. Income taxes for the first nine months of 2017 were recorded using an estimated effective tax rate of 39%. During the fourth quarter of 2017, we determined in accordance with accounting standards that a valuation allowance or reserve against our deferred tax assets was required. Our deferred tax assets primarily relate to deferred revenue and lease accounting items. Based on the resulting impact of the passage of the Tax Reform Act and the valuation allowance on the Company’s deferred tax assets, the Company recorded a charge of approximately $310.0 million to the income tax provision in our U.S. markets for the fourth quarter ended December 31, 2017. Going forward we expect our consolidated effective tax rate to be between 22% and 26%. The Company will host a conference call via webcast for investors and other interested parties beginning at 7:30 a.m. CST/8:30 a.m. EST on Thursday, March 1, 2018. To listen to the conference call via the internet, please visit the investor relations section of the AMC website at www.investor.amctheatres.com for a link to the webcast. Investors and interested parties should go to the website at least 15 minutes prior to the call to register, and/or download and install any necessary audio software. Participants may also listen to the call by dialing (877) 407-3982, or (201) 493-6780 for international participants. An archive of the webcast will be available on the Company’s website after the call for a limited time. This press release, along with other news about AMC, is available at www.amctheatres.com. We routinely post information that may be important to investors in the Investor Relations section of our website, www.investor.amctheatres.com. We use this website as a means of disclosing material, non-public information and for complying with our disclosure obligations under Regulation FD, and we encourage investors to consult that section of our website regularly for important information about AMC. The information contained on, or that may be accessed through, our website is not incorporated by reference into, and is not a part of, this document. Investors interested in automatically receiving news and information when posted to our website can also visit www.investor.amctheatres.com to sign up for email alerts. This press release includes “forward-looking statements” within the meaning of the “safe harbor” provisions of the United States Private Securities Litigation Reform Act of 1995. Forward-looking statements may be identified by the use of words such as “forecast,” “plan,” “estimate,” “will,” “would,” “project,” “maintain,” “intend,” “expect,” “anticipate,” “prospect,” “strategy,” “future,” “likely,” “may,” “should,” “believe,” “continue,” “opportunity,” “potential,” and other similar expressions that predict or indicate future events or trends or that are not statements of historical matters. These forward-looking statements are based on information available at the time the statements are made and/or management’s good faith belief as of that time with respect to future events, and are subject to risks, trends, uncertainties and other facts that could cause actual performance or results to differ materially from those expressed in or suggested by the forward-looking statements. These risks, trends, uncertainties and facts include, but are not limited to, risks related to: motion picture production and performance; AMC’s lack of control over distributors of films; intense competition in the geographic areas in which AMC operates; increased use of alternative film delivery methods or other forms of entertainment; shrinking exclusive theatrical release windows; international economic, political, regulatory and other risks; risks and uncertainties relating to AMC’s significant indebtedness; AMC’s ability to execute cost cutting and revenue enhancement initiatives; box office performance; additional impairment related to AMC’s NCM investment; limitations on the availability of capital; risks relating to AMC’s inability to achieve the expected benefits and performance from its recent acquisitions; AMC’s ability to comply with a settlement it entered into with the U.S. Department of Justice pursuant to which it agreed to divest holdings in National CineMedia, LLC; AMC’s ability to refinance its indebtedness on favorable terms; optimizing AMC’s theatre circuit through construction and the transformation of its existing theatres may be subject to delay and unanticipated costs; failures, unavailability or security breaches of AMC’s information systems; risks relating to impairment losses, including with respect to goodwill and other intangibles, and theatre and other closure charges; AMC’s ability to utilize net operating loss carryforwards to reduce its future tax liability or valuation allowances taken with respect to deferred tax assets; review by antitrust authorities in connection with acquisition opportunities; risks relating to unexpected costs or unknown liabilities relating to recently completed acquisitions; risks relating to the incurrence of legal liability including costs associated with recently filed class action lawsuits; general political, social and economic conditions and risks, trends, uncertainties and other factors discussed in the reports AMC has filed with the SEC. Should one or more of these risks, trends, uncertainties or facts materialize, or should underlying assumptions prove incorrect, actual results may vary materially from those indicated or anticipated by the forward-looking statements contained herein. Accordingly, you are cautioned not to place undue reliance on these forward-looking statements, which speak only as of the date they are made. Forward-looking statements should not be read as a guarantee of future performance or results, and will not necessarily be accurate indications of the times at, or by, which such performance or results will be achieved. For a detailed discussion of risks, trends and uncertainties facing AMC, see the section entitled “Risk Factors” in AMC’s Annual Report on Form 10-K, filed with the SEC on March 1, 2018, and the risks, trends and uncertainties identified in its other public filings. AMC does not intend, and undertakes no duty, to update any information contained herein to reflect future events or circumstances, except as required by applicable law.